In the third novel in this highly praised mystery series that will appeal to fans of The Killing, Top of the Lake, and The Bridge, Edie Kiglatuk works as a summer school teacher in the Canadian arctic. When one of her female students is found dead in nearby Lake Turngaluk, Edie enlists the help of Sergeant Derek Palliser to pursue the case, promising the girl’s Inuit family that they will uncover the truth. Meanwhile, lawyer Sonia Gutierrez investigates the toxicity of the lake and suspects that there might be a larger conspiracy involved. As the three clamber over rocky terrain under twenty-four-hour daylight they start to unearth secrets long frozen over—risking their own lives in the process. 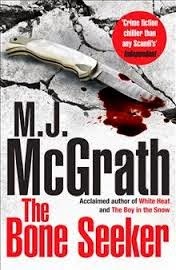 With stunning prose, M. J. McGrath delivers another thrill ride through a hauntingly beautiful landscape. The plot revolves around a local girl who is murdered, throw in an understaffed police department, local secrets and a mysterious Dept. of Defence section and you have the plot. Sound familiar? I thought so. The only difference is that it is set in the Arctic Tundra and features Inuit people. The setting is something I could not envisage and therefore a lot of the descriptive narrative was lost on me. I haven't heard of this author before, one to watch out for I would think. Thanks for sharing your view.